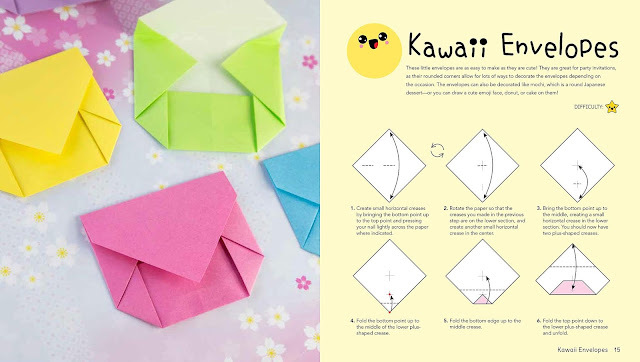 I just got Chrissy Pushkin's new book Kawaii Origami: Super Cute Origami Projects for Easy Folding Fun. 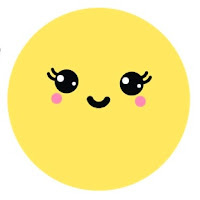 In Japanese culture kawaii means cute. 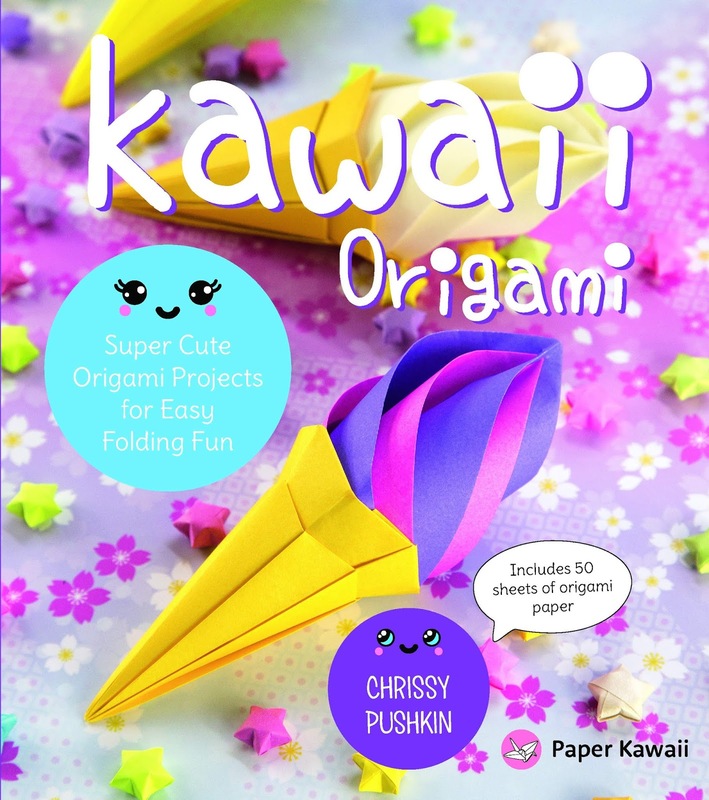 Chrissy is the creator of the very popular origami and paper craft website Paper Kawaii. 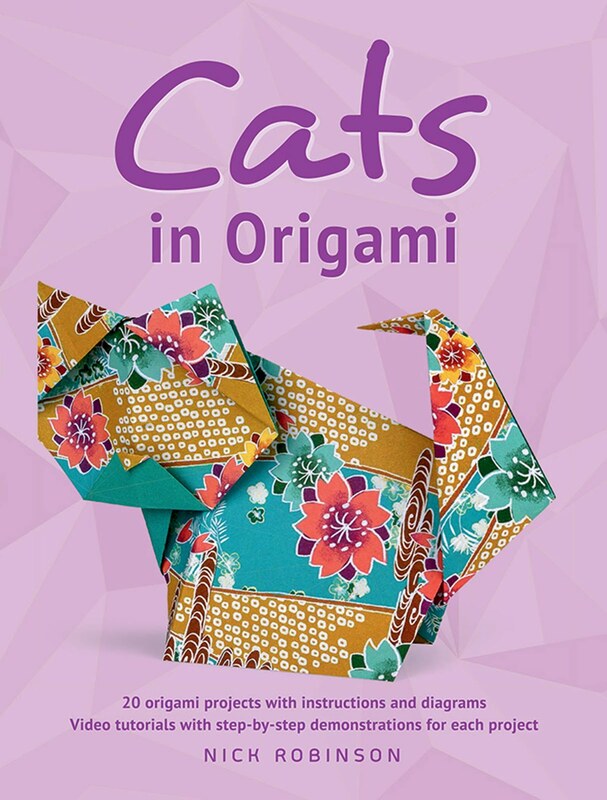 In her 128 page softcover she presents 25 kawaii origami models. 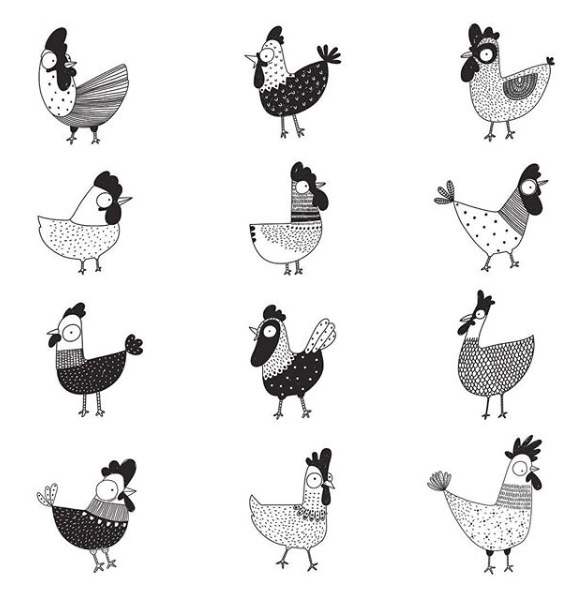 Don't let the word cute mislead you, her designs are very clever. They are detailed yet rewarding to fold. So far I've folded the rectangular masu box, the cute purse and the adorable cat and dog hearts. The table of contents is shown below. The projects are arranged easy to difficult. Step-by-step diagram and text instruction accompanies each design, and in some cases a video. There are various recommended paper sizes and a few projects require glue and/or scissors. To get you started 50 sheets of folding paper are included. The mostly pastel colors with white backs measure 6 inches square (15 cm). Race Point Publishing released this title April 2, 2019. A Kindle version is also available. Get your copy below! 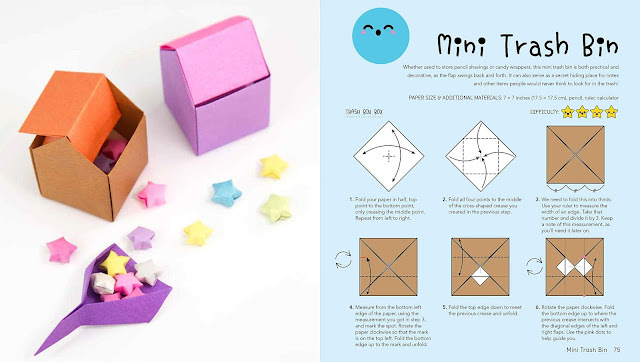 Kawaii Origami is available worldwide at Race Point Publishing. Check out their unique catalog at Race Point Publishing. Race Point Publishing is a division of the Quarto Publishing Group USA. A Dog Heart I folded from page 50 of Kawaii Origami. I used 1 sheet of 7 inch (17.78 cm) square origami paper with a purple front and light blue back. No scissors, tape or glue was used. I added stickers for the eyes and nose. So kawaii! Learn about and fly a kaleidoscope of butterflies with Beautiful Press-Out Flying Butterflies by Richard Merrill! There are 24 bright and striking butterflies in total. All pages are perforated for easy removal. To use, carefully punch out the butterfly, follow the folding instructions, add a coin for weight, then fly like a paper plane. Diagram and text instructions are included. All of these butterflies are larger than life but otherwise realistic. They have an almost nine-inch wingspan! Both top and underside wing patterns are illustrated in full color. 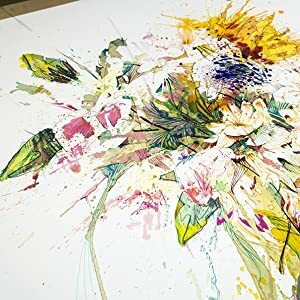 In addition each butterfly comes with a snippet of information including genus, Greek name, habitat, coloring, diet and other interesting facts. You will need a coin and 2 pieces of tape for each butterfly. The book says to use a nickel, however there is a correction on the authors website that says "Use a penny instead of a nickel weight for a smoother flight!" This book is perfect for budding lepidopterists (butterfly experts) and nature lovers. I've assembled my first butterfly and am off to test fly it! Dover Publications released this 48 page paperback on February 13, 2019. Get your copy below! Reakirt's Blue butterfly punched out and ready for folding. Note the dotted white fold lines. 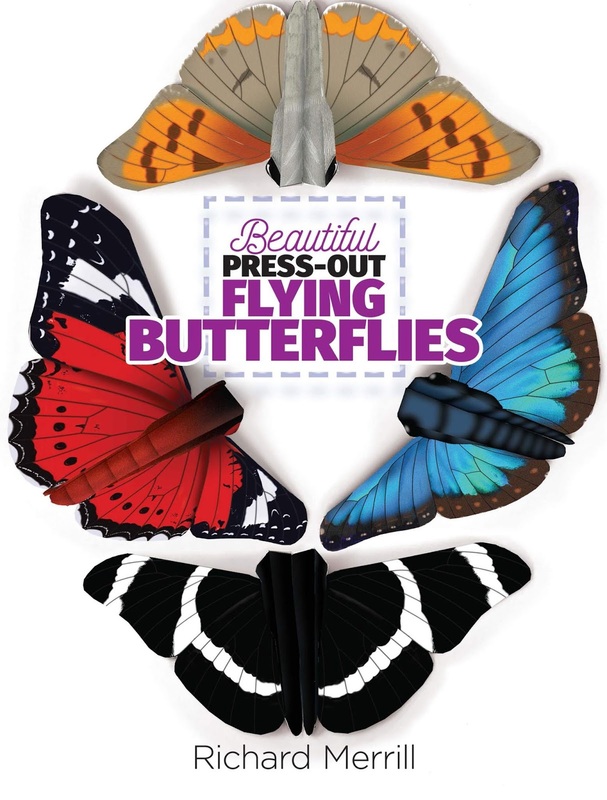 Beautiful Press-Out Flying Butterflies is available worldwide at Dover Publications. Dover, Great Books, Variety & Value Since 1941. Check out their catalog at Dover Publications. Dover has generously offered to giveaway a copy! One winner will be selected at random. 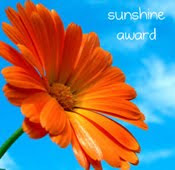 Open until April 18, 2019. Canadian & US addresses only. Good luck! Your task is to draw 62 animals and make them cute. Your guide is favored Instagram illustrator hee_cookingdiary. Your book is Draw 62 Animals and Make Them Cute: Step-by-Step Drawing for Characters and Personality by Heegyum Kim. On large printer size pages (8.5 x 11) the illustrator/author studies the animal kingdom. 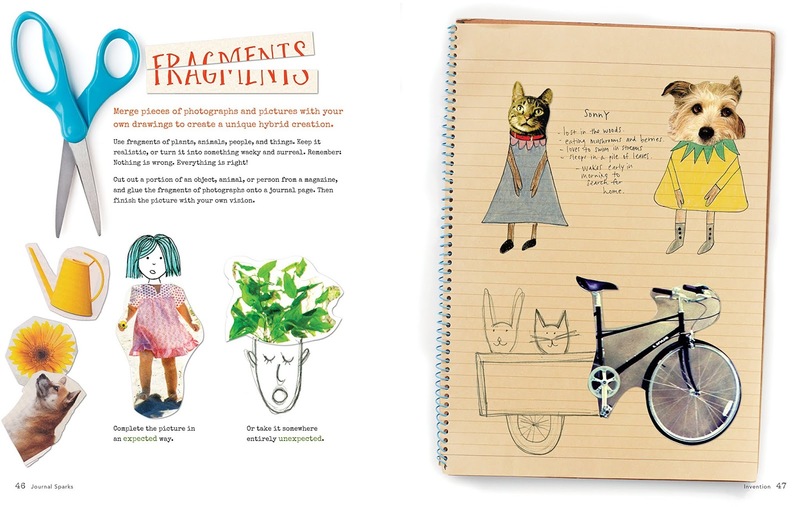 On the left page, showing step-by-step, she brings each animal to life, infusing them with personality. Try it yourself in the dedicated space provided. As shown below she does it well. Her animals are very appealing. On the right page is an opportunity for you to modify your drawing - try changing the pose, expression, and/or activity. Several examples and open spaces are offered. Scattered throughout are helpful creative and technical TIPs. 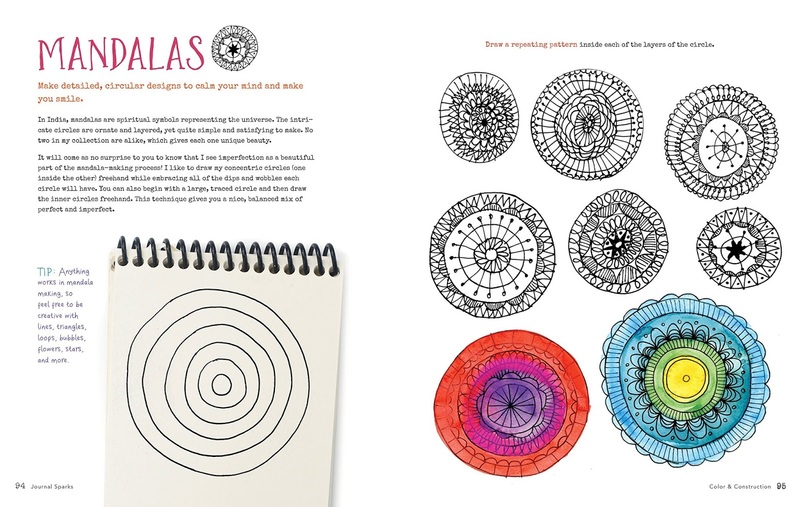 This charming and delightful book will help you improve your drawing skills. The 128 page paperback will be released March 26, 2019 by Quarry Books. You can pre-order it now. Get your copy below! One of the many tips throughout. 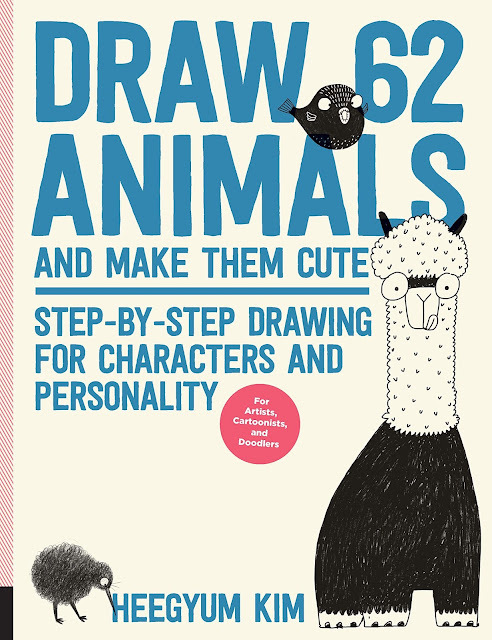 Draw 62 Animals and Make Them Cute is available worldwide at Quarry Books, a division of the Quarto Publishing Group USA. Check out their unique catalog at Quarry Books. Part of the back cover of my copy. 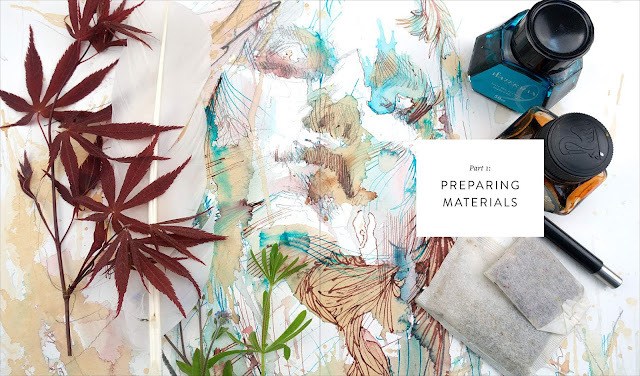 Origami of the Sea comes with everything you need to start folding right away! As shown on the cover below there are 8 aquatic origami projects. Step-by-step text and diagram instructions accompany each model. 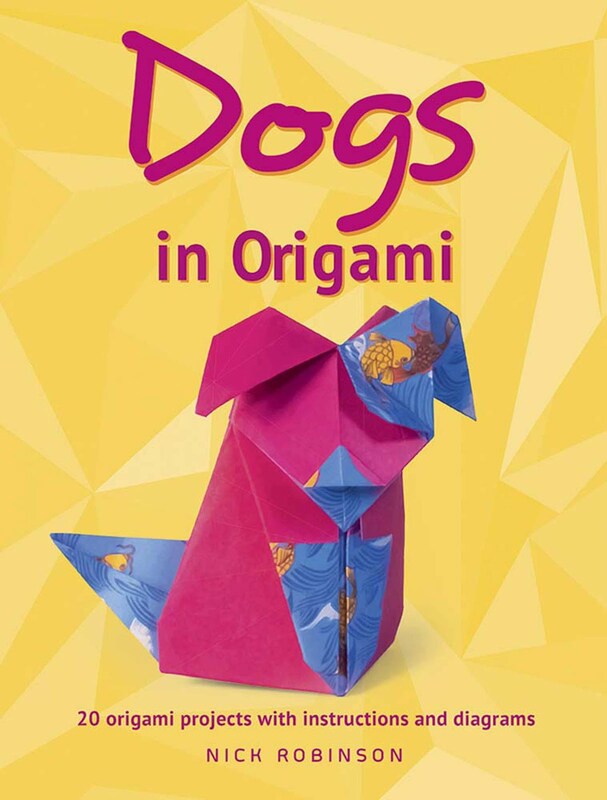 There are 200 sheets of colorful origami paper measuring 17.8 x 17.8 cm (7 x 7") . This paper comes in a variety of solid colors and patterns, all with a matte finish. 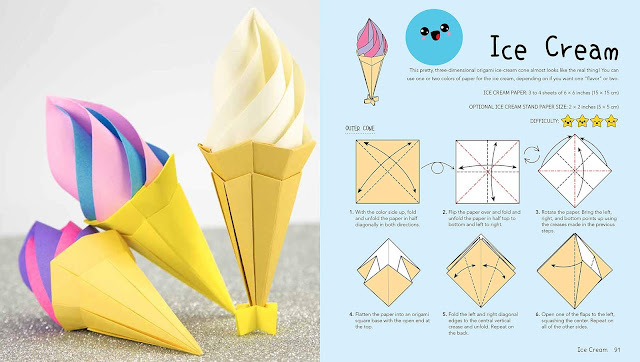 You also get a link to video instructions clearly demonstrating how to fold each design. A variety of noted paper folders created these models - Vanda Battaglia, Pasquale D'Auria, Francesco Decio, Marc Kirschenbaum, and Nick Robinson. This 256 page paperback will be released on March 20, 2019 by Dover Publications. You can pre-order now. Get your copy below! 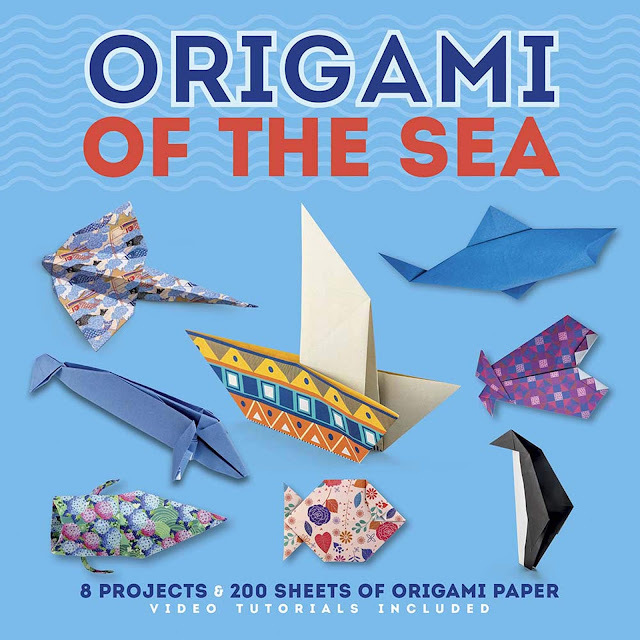 Origami of the Sea is available worldwide at Dover Publications. Dover, Great Books, Variety & Value Since 1941. Check out their catalog at Dover Publications. Dover has generously offered to giveaway a copy! One winner will be selected at random. Open until March 31, 2019. Canadian & US addresses only. Good luck! 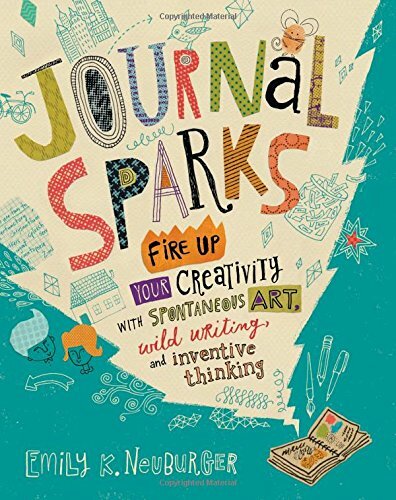 You don't have to be a kid to love Journal Sparks: Fire Up Your Creativity with Spontaneous Art, Wild Writing, and Inventive Thinking by Emily K. Neuburger. It's a mixed media, artistic adventure! 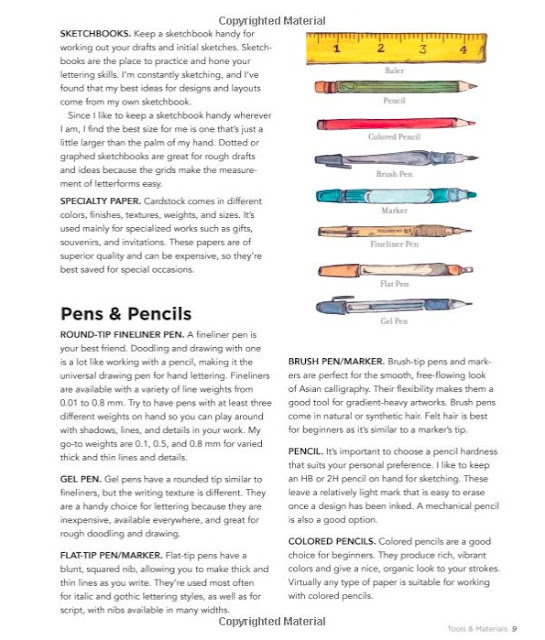 Collect your favorite art supplies and ideally a blank journal. With 60 imaginative and engaging art prompts it's bound to inspire a creative journaling habit. As shown below, the activities run the gamut - from coloring, to cutting and pasting, drawing and writing, folding and more. It comes with 10 pages of vibrantly colored collage paper, 3 pages of stickers, 1 page of pop-out speech bubbles and an envelope template. I'm not surprised it's won a bunch of awards. Its pages are amusing, delightful and motivational. I treated myself to a new journal and watercolor paint set while examining Journal Sparks. If you wonder what I'm up to, I'll be reveling in its pages! Storey Publishing released the 164 page paperback on April 18, 2017. Get your copy below! 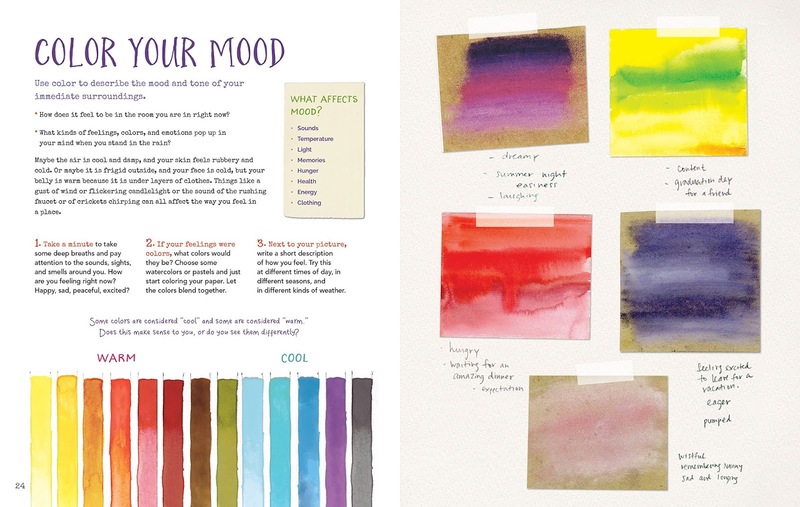 COLOR YOUR MOOD pages 24 and 25. FRAGMENTS pages 46 and 47. MANDALAS pages 94 and 95. 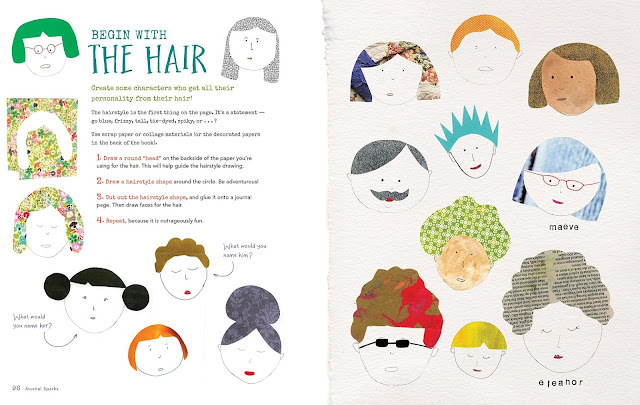 BEGIN WITH THE HAIR pages 96 and 97. TINY POEMS pages 102 and 103. 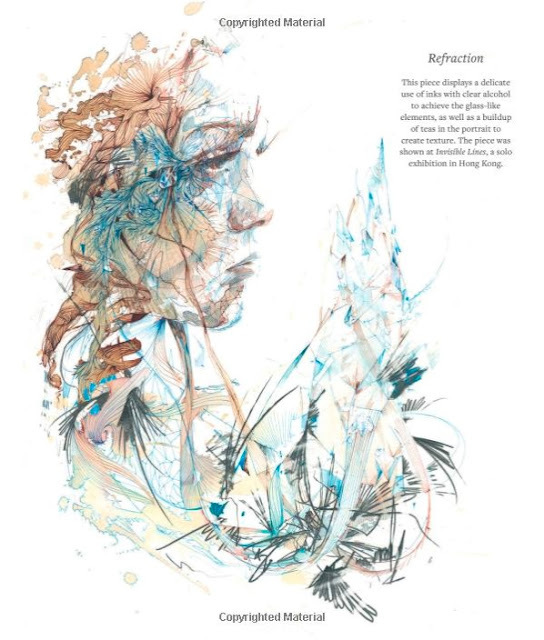 Journal Sparks is available worldwide at Storey Publishing. Check out their unique catalog at Storey Publishing. Storey Publishing is an imprint the The Workman Publishing Company. Journal Sparks and my new watercolor paints and journal. No paint? 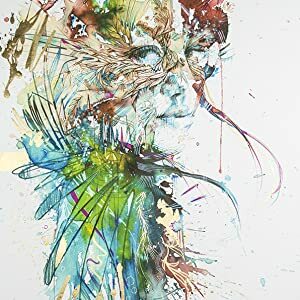 No problem: Says British painter Carne Griffiths whose dynamic and fantastical paintings in ink, tea and alcohol sell for upwards of £3,500. In his just released book, The Organic Painter, he reveals how he uses unconventional materials and techniques in his work. His unique book is divided into two main parts. Part 1 - Preparing Your Materials - is about getting ready to paint. It covers the stuff you need to do before you paint. 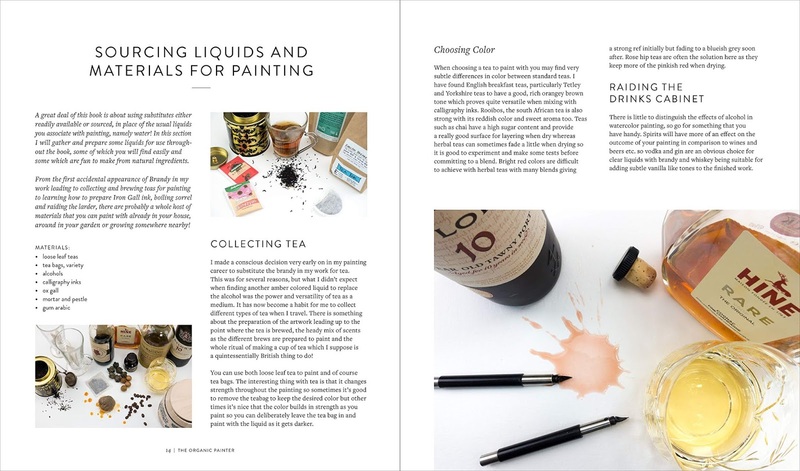 It even includes step-by-step instructions for making your own ink and fashioning a quill from a turkey or goose feather! Part 2 - Projects - is about challenging your creative process. 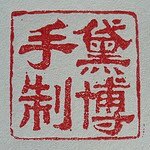 There are 15 themes with exercises designed to introduce unusual materials and/or techniques to your painting. The idea is to try new things, explore and experiment as part of the painting process. 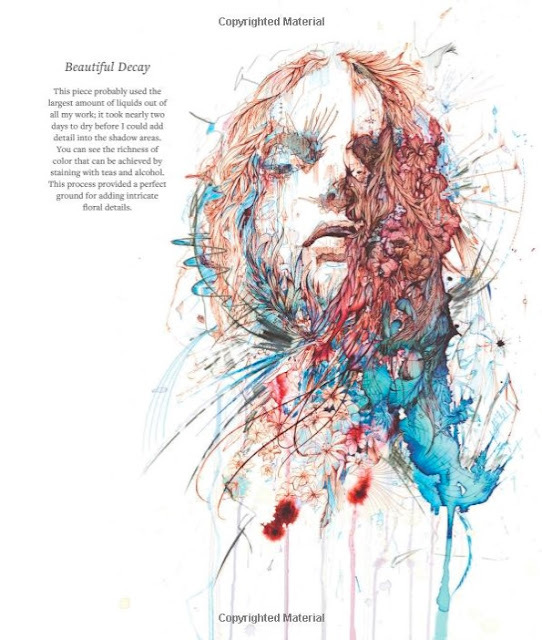 You will not lack for inspiration, samples of the artist's impressive work are throughout. 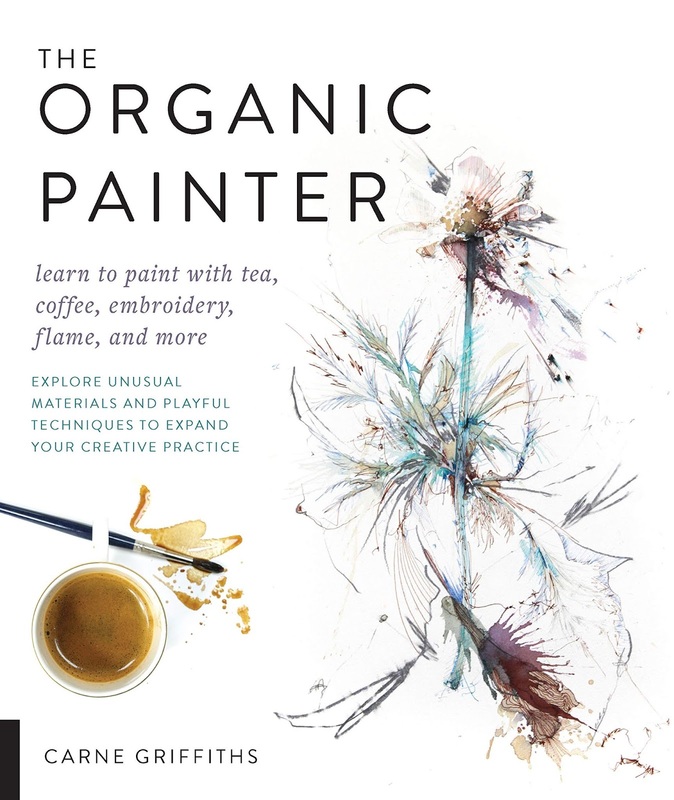 This book has changed the way I think about painting and creating! Quarry Books released this 128 page paperback February 12, 2019. A Kindle version is also available. Get your copy below! I just can’t sit still when I paint! If I am in a comfortable position when working it seems to create a stillness to my work, which just doesn’t suit me. As a result, I have taken to working at all sorts of angles and using an easel that adjusts quickly from horizontal to vertical. This movement has had a huge effect on my painting—as I rotate and tilt the board, I create accidental spills and arcs in the work, which I then use and interpret into my style of painting. Metallic paints can give a real richness to a piece of work. The way that they play with the light and jump out from the page makes them ideal for highlighting areas of your work. Gold, silver, and copper leaf create a smooth and reflective surface. These are generally available as imitation gold—or even as real gold up to 24 karats—and give your work a real opulence! Using gold leaf in a painting usually works best right at the end of the process; you can create layers that will sit over the gold, but the full impact of using it will be lost slightly. The Organic Painter is available worldwide at Quarry Books, a division of the Quarto Publishing Group USA. Check out their unique catalog at Quarry Books. Quarto has generously offered to giveaway a copy! One winner will be selected at random. Open until March 18, 2019. Canada & the USA only. Good luck! Have a story to tell? 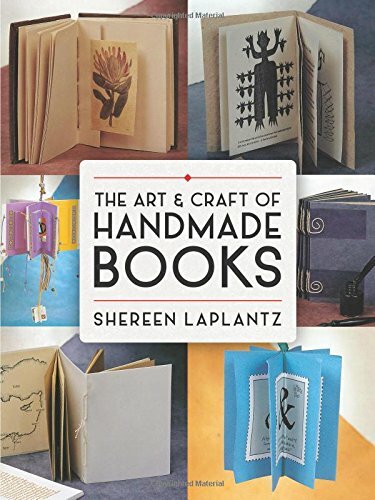 Make your own books with The Art & Craft of Handmade Books by Shereen LaPlantz. This packed guide contains written and illustrated instructions for seven book models and 25 patterns. It's a revised and updated reprint of work first published in 2001 by Lark Books. While there are prettier books, for substance this book stands the test of time. 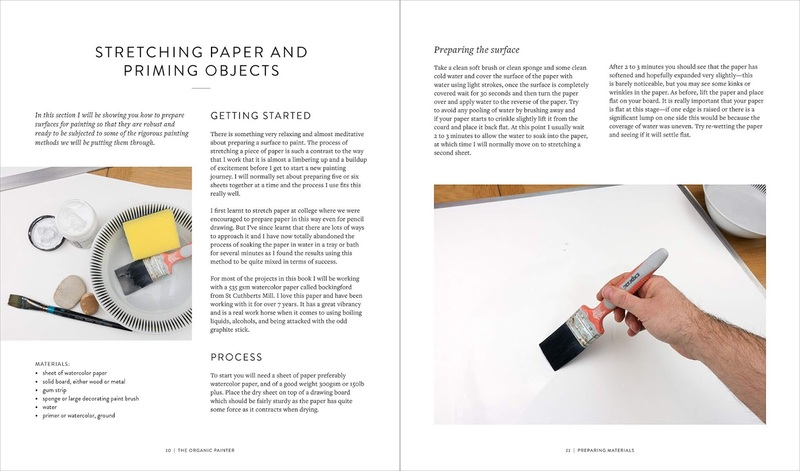 Learn step-by-step how to create a wide range of handmade books using a variety of materials, tools and techniques. The first project and a variation are shown below - the Concertina and the Concertina with a Text Book Wrapper. 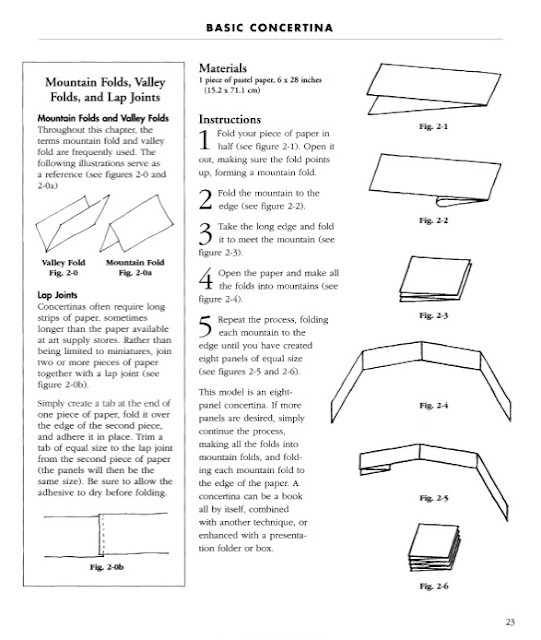 Making them involves measuring, cutting and folding paper. Successive projects build upon each other. Latter chapters focus on stitched or sewn bindings. See the complete table of contents below. Multiple galleries showcase contributions from more than sixty artists. Dover Publications released this 128 page paperback July 20, 2016. A Kindle edition is also available. Get your copy below! 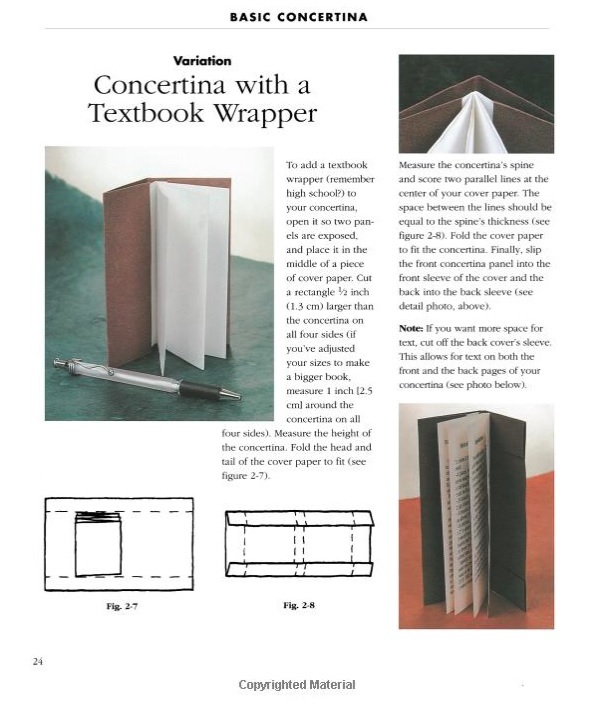 The Art & Craft of Handmade Books is available worldwide at Dover Publications. 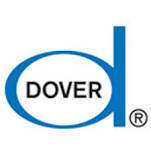 Dover, Great Books, Variety & Value Since 1941. Check out their catalog at Dover Publications. Dover has generously offered to giveaway a copy! One winner will be selected at random. Open until March 10, 2019. Canadian & US addresses only. Good luck! 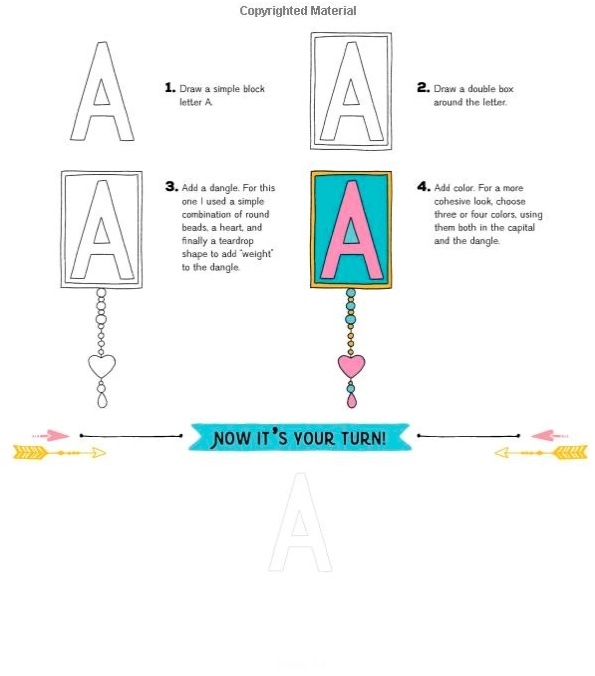 Want to create beautiful letters and intricate strings of charms? 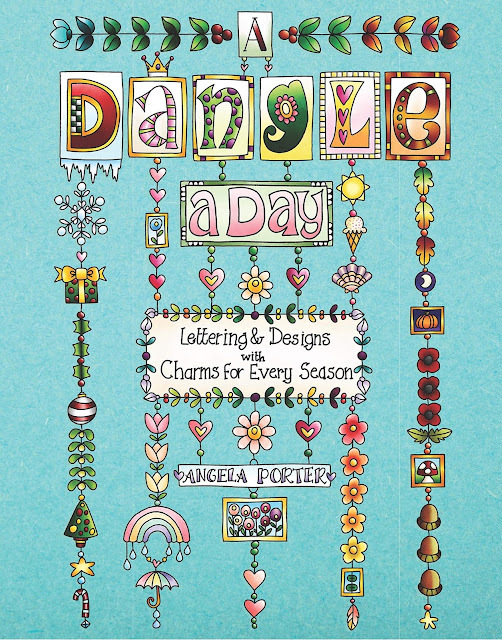 Angela Porter (the best-selling coloring book creator) is the author and illustrator of A Dangle a Day. It's a fun workbook for anyone interested in learning how to dangle. Angela demos how she builds her dangles, layer-by-layer, from pencil sketch through adding color. She dangles the letters of the alphabet, numbers and all four seasons. Her dangles become more elaborate as you progress through the book. Following every demo is a space called "Now it's your turn!". This is where you get to practice and experiment with dangling. Follow the authors example or do your own thing. There are 68 step-by-step dangling exercises. I've included the first two below. Use the tools and materials of your choice or follow the authors recommendations. 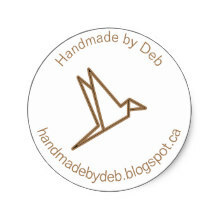 Dangles are perfect for accenting artwork, stationery, planners, and journals. An introduction to bullet journaling also known as BuJo is included. Race Point Publishing released this 144 page paperback on January 15, 2019. Get your copy below! My copy. Product Dimensions: 20.3 x 1.7 x 25.4 cm (8 x 0.6 x 10 inches). 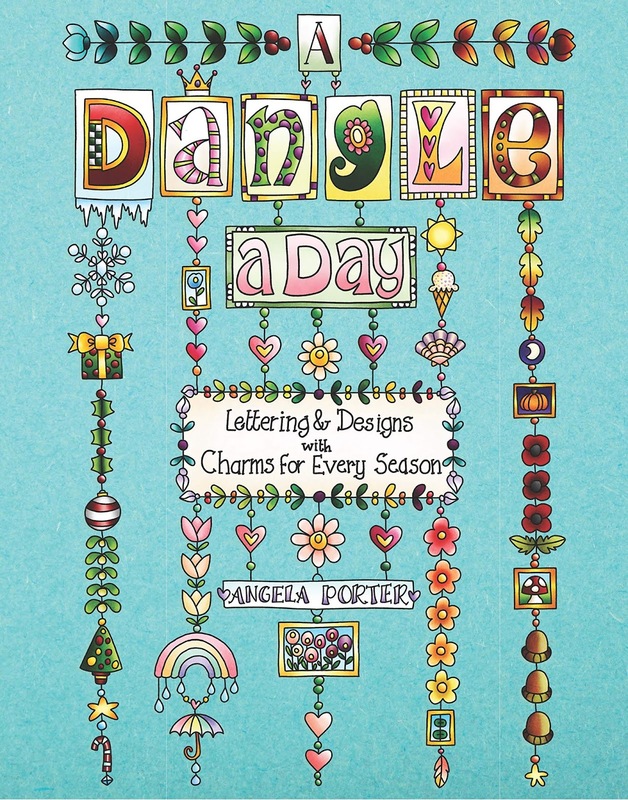 A Dangle a Day is available worldwide at Race Point Publishing. Check out their unique catalog at Race Point Publishing. Race Point Publishing is a division of the Quarto Publishing Group USA. 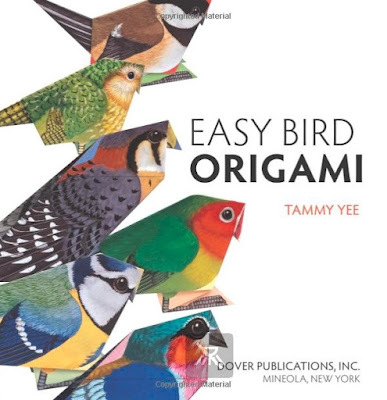 Learn about and fold 30 colorful birds with Easy Bird Origami by Tammy Yee. To use simply remove the page of the bird you would like to fold. The pages are perforated for easy removal. One side of the paper has fun facts about the bird. 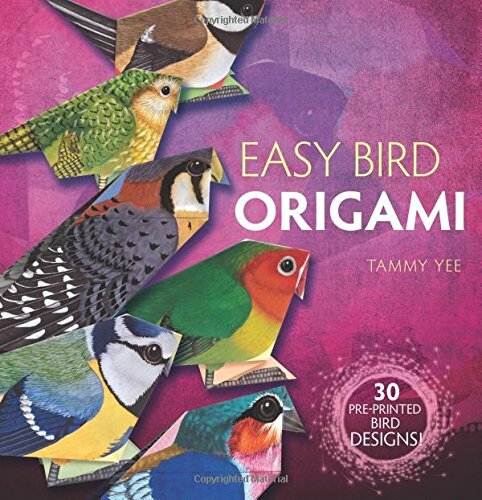 The other is pre-printed with origami fold lines and a realistic bird image just waiting to be revealed. All 30 bird folds are one of two origami models the Standing Bird or the Flying Bird. Diagram with text instructions are provided. If you get hopelessly stuck there is a link to a step-by-step video on YouTube. The 8 inch square paper is extra durable, making it harder for small hands to tear. Dover Publications released this 64 page paperback on July 18, 2017. 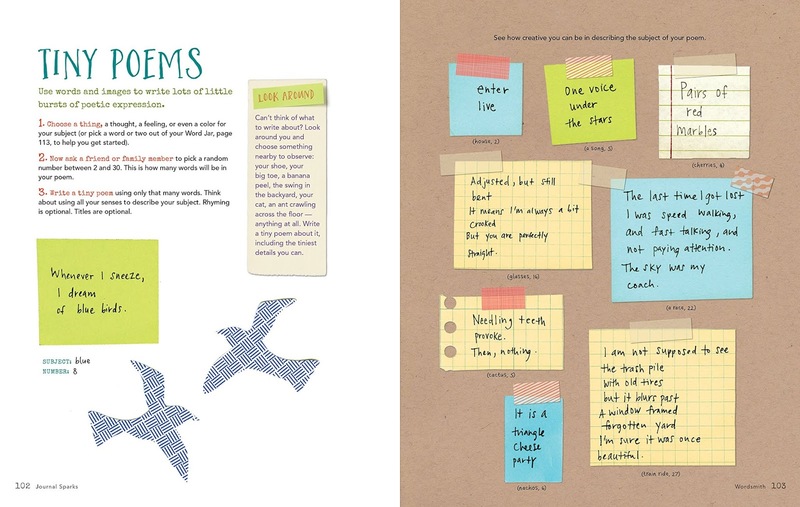 It's ideal for young paper folders and birders alike. Get your copy below! Product Dimensions: 8.5 x 0.1 x 9.5 inches (21.6 x 0.3 x 24.1 cm). This is the Standing Bird model I folded by following Tammy's YouTube video. I used dollar store paper to practice. The model stands very well. I quite like the design. Easy Bird Origami is available worldwide at Dover Publications. Dover, Great Books, Variety & Value Since 1941. Check out their catalog at Dover Publications. Dover has generously offered to giveaway a copy! One winner will be selected at random. Open until February 21, 2019. Canadian & US addresses only. Good luck! Learn and improve your lettering with the Hand Lettering A to Z Workbook by Abbey Sy. Her terrific new volume is a workbook for practicing letters. 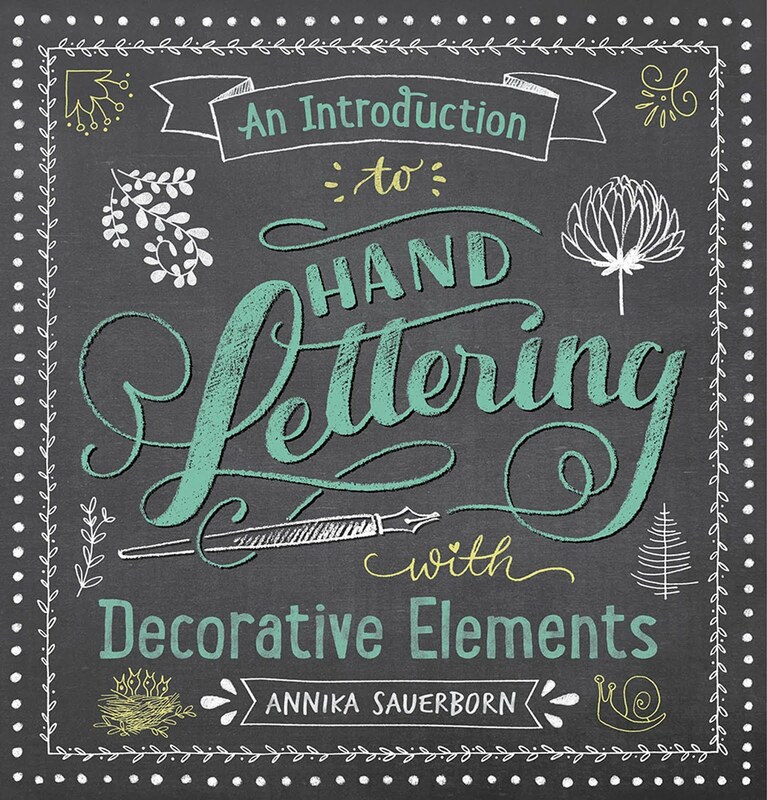 It contains instructions and guided exercises related to hand lettering. With over 80 two-sided worksheets, you'll get plenty of practice. These full-size pages are perforated for easy removal. Abbey leads you through a wide range of styles. See the detailed Table of Contents below. 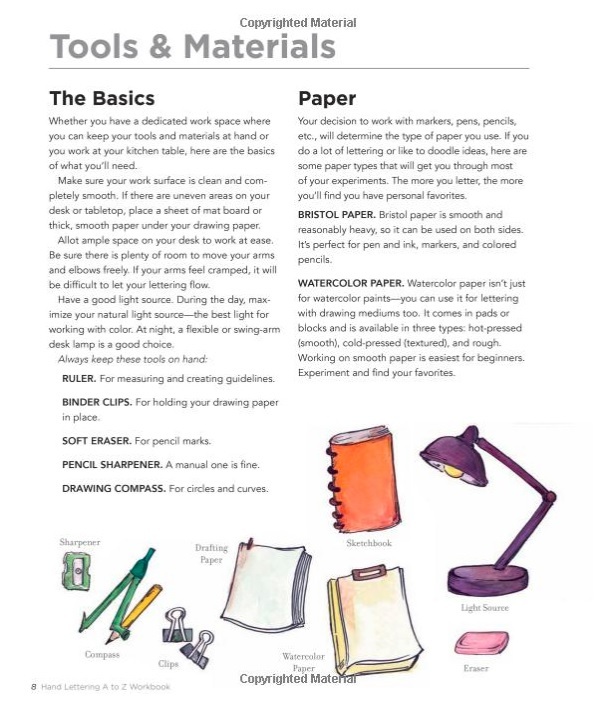 I've included an excerpt from the Tools & Materials section to show the tools needed to get started. 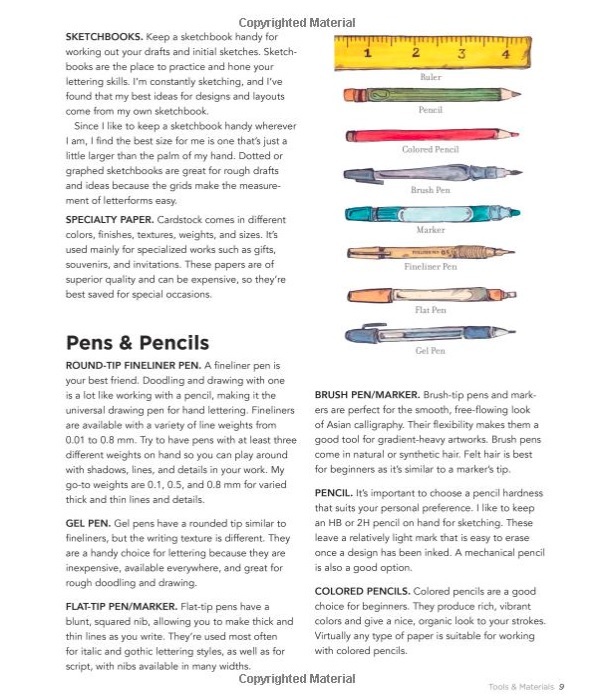 You probably already have them - a pencil, colored pencils, various pens and markers. 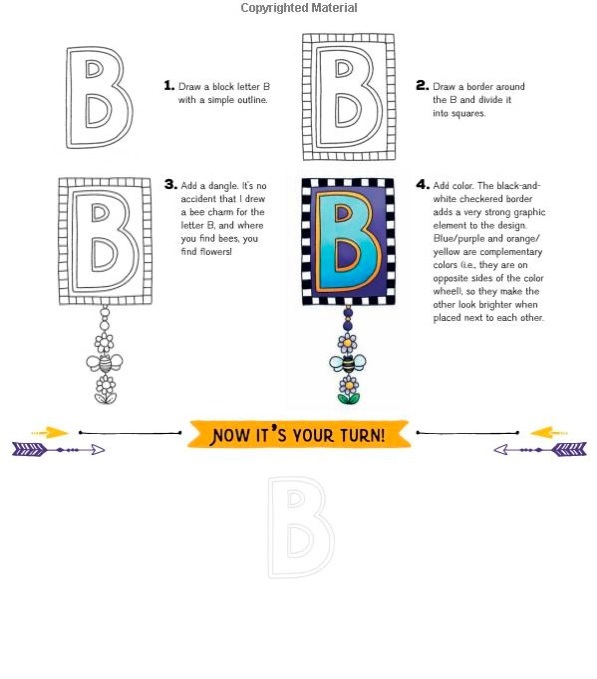 Abbey's new workbook makes lettering practice easy - just follow the prompts! Rockport Publishing released the 192 page paperback was October 16, 2018. Get your copy below! 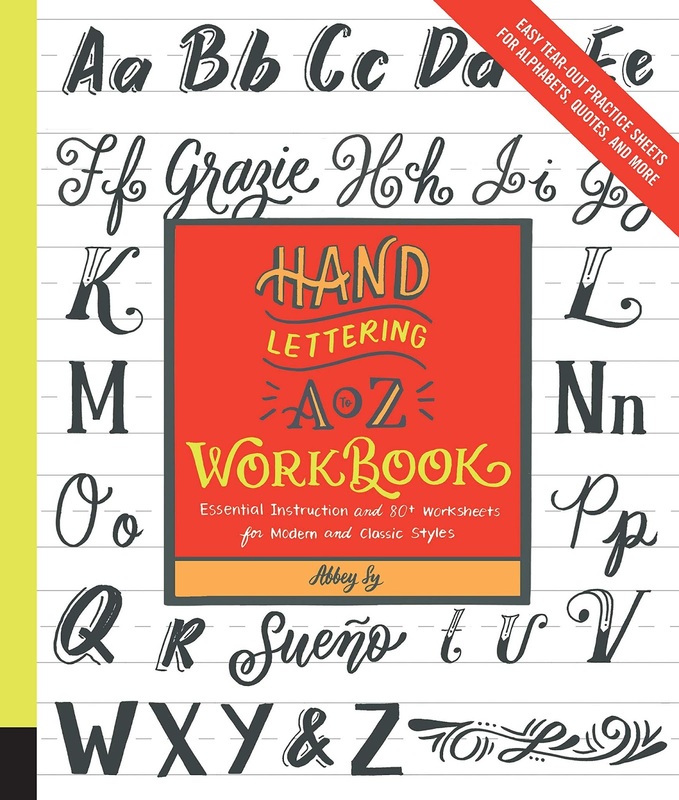 The Hand Lettering A to Z Workbook is available worldwide at Rockport Publishing, a division of the Quarto Publishing Group USA. 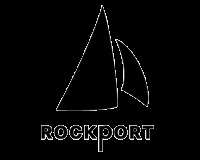 Check out their unique catalog at Rockport Publishing. My copy. Product dimensions: 8.6 x 0.6 x 11.1 inches (21.8 x 1.7 x 28.2 cm).